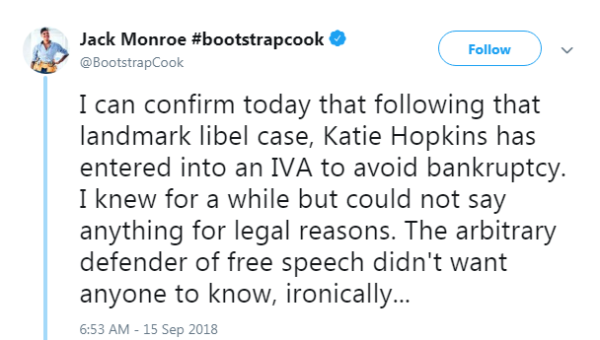 Katie Hopkins has filed for an individual voluntary arrangement, reportedly to avoid bankruptcy after losing a major libel case to food writer Jack Monroe. The former Mail Online columnist and LBC presenter was told to pay £24,000 in libel damages and £107,000 in legal costs to author Monroe last year. Monroe took Hopkins to court over two tweets from 2015, which she said falsely implied she was in support of vandalism of war memorials by protesters and had caused “serious harm” to her reputation. The author initially gave Hopkins the option of apologising and paying £5,000 to a migrant charity, but she refused to back down. Monroe said on Saturday that although she had been paid in full, her lawyers and other creditors are yet to receive payment as Hopkins has filed for an IVA. The IVA application from May can be viewed on the Individual Insolvency Register. In a series of tweets, Monroe said: “I can confirm today that following that landmark libel case, Katie Hopkins has entered into an IVA to avoid bankruptcy. 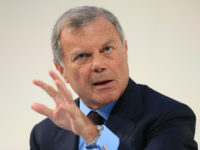 “I knew for a while but could not say anything for legal reasons. The arbitrary defender of free speech didn’t want anyone to know, ironically. “I have been paid in full, but many of her creditors, including my lawyer, will not be paid what they are owed. 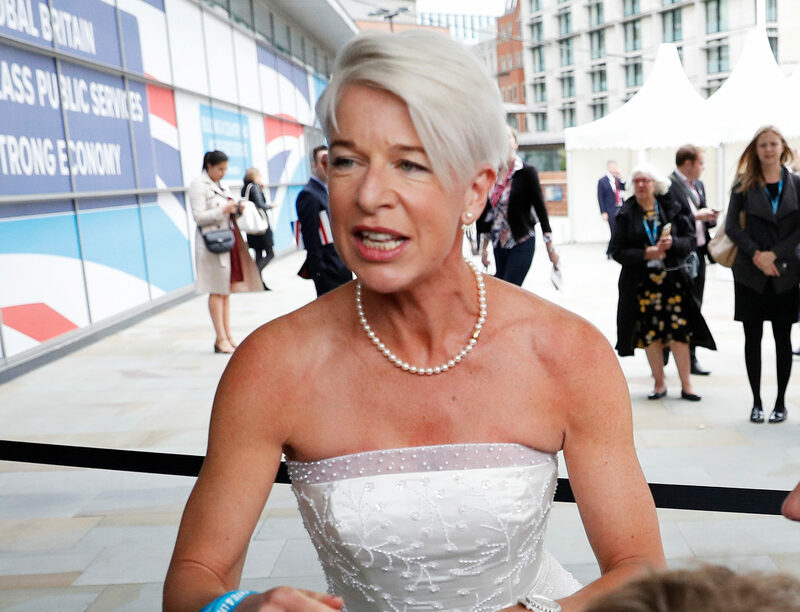 In May last year, Hopkins lost her radio show on LBC after calling on Twitter for a “final solution”, echoing the Nazi term for the holocaust, in response to the Manchester Arena bombing. She left her Mail Online column after two years by “mutual consent” in November. 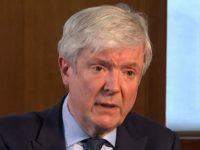 In 2016, Mail Online was forced to pay £150,000 to a Muslim family who Hopkins had falsely accused of having extremist connections, and last year the publisher apologised and paid “substantial damages” to a teacher libelled in one of her columns. Hopkins currently writes for right-wing Canada-based website Rebel Media alongside former English Defence League leader Tommy Robinson. Hopkins has been contacted for comment.